Valentine’s Week is here and before couples get absorbed by multiple consumerist ideas floating around in the economy trying to cajole them into buying the next big gift or car for their loved ones, for their next like-worthy Instagram post, there are surely some other pocket friendly ways to get your partner to snuggle up to you. Surely, we all will get rolling by the idea of watching films and listening to music, and yes they are totally wonderful ideas to indulge in, however, read on for some not-so-romantic film suggestions this week. A word of caution. The recommendations that follow may or may not have a happy ending, in the conventional sense of the phrase, but will surely get you closer to the idea of love. They are great to be watched alone as well. So lie down and stream on. This Shah Rukh Khan starrer is the story of a shy soul who loves the idea of loving from a distance. While his love interest gets wooed away, one day at a time, will Sunil (Shah Rukh Khan) be able to confront his fears and win over the woman he so deeply desires? 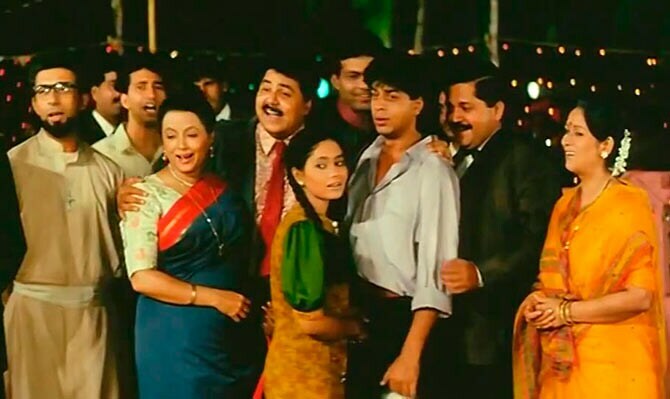 A must watch for Shah Rukh’s unabashed performance as a love-seeking-yet-playfully-deceitful Sunil. Amar (Shah Rukh Khan) will go to any extent to be with Meghna (Manisha Koirala). There is a big catch, however, that Amar is not yet aware of. As he begins to realise the cost of love, he learns that it could spell death for him. Will he give away his life to be with Meghna or will they find a solution to be united in love that does not lead to them dying? Devdas is the poster boy of unrequited love. He fails to understand people for various reasons, most prominent ones being, he is selfish, narcissist and alcoholic. Devdas is the story retold several times, in different forms, but Sanjay Leela Bhansali’s is the one that manages to stand out, at least this week. And amongst other reasons for the same, it is Devdas himself? Unromantic Veronica (Deepika Padukone) falls in love with commitment-phobic Gautam (Saif Ali Khan) in this romantic drama. However, there is a small twist. Meera (Diana Penty), Veronica’s roommate and best friend, also likes Gautam, who, turns out, likes Meera as well. Will Veronica suffer a heartbreak or will her one-sided love prevail, laying bare the strong ties of friendship and understanding the three claim to share? Ritesh Batra’s directorial is a love story over handwritten letters and tiffin boxes. The notion of warmth is inked in each word that corresponds between the acquaintances, and is reinforced through each frame, each moment of film. Irrfan is absolutely endearing as the widower Saajan, who speaks to us even through his awkward movements of discomfort, and Ila (Nimrat Kaur) is too. Other honorable mentions include Tere Naam (2003), Rehnaa Hai Terre Dil Mein (2001), Titanic (1997), 500 Days of Summer (2009), Atonement (2007), Enough Said (2013) and Moonlight (2016). A bucket of popcorn, a cozy blanket and tissues to go with them are highly underrated.